(Nanowerk News) Digital Surf, the provider of MountainsMap® surface analysis software announced that visitors to its web site can request a free surface analysis report based on their own measurement data. 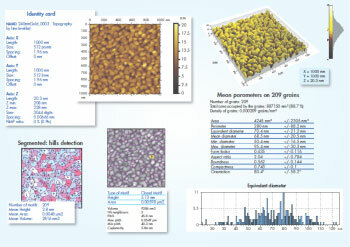 The report will give users of 2D and 3D profilometers, optical microscopes and scanning probe microscopes who are not familiar with MountainsMap® the opportunity to get acquainted with its powerful features for visualizing measurement data, analyzing this data and generating a detailed visual analysis report. Extract from a MountainsMap® surface analysis report. MountainsMap® supports numerous surface metrology instrument data formats. It will be possible to request a free MountainsMap® analysis report from Digital Surf on www.digitalsurf.com up until the end of June 2010. Digital Surf, founded in 1989, is a leading provider of imaging and analysis software for surface metrology instruments including 2D and 3D profilometers, optical microscopes and scanning probe microscopes. Imaging and analysis software based on Digital Surf’s Mountains® technology is integrated by leading instrument manufacturers and is used in thousands of laboratories and industrial facilities working in numerous sectors including aerospace, automotive, cosmetics, energy, MEMS, materials research, medical, metallurgy, nanostructures, optics, paper, PCB, plastics, polymers, printing, semiconductor, etc. Over 5,000 Mountains® software licences are installed worldwide.